Send Love Hearts to Chennai. Gifts to Chennai. Send Gift Hampers to Chennai. 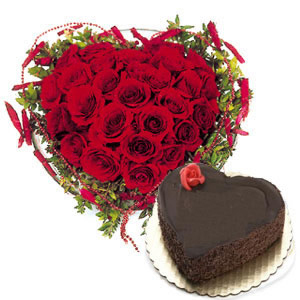 Description : A Gift Hamper comprising of 50 Red Roses arranged in a Heart Shape and a One Kg Heart Shaped Cake will be a surefire success on any occasion. Charm your loved ones in India with this attractive Gift Hamper and make them miss you immensely.